Located between Locarno Beach to the east and the University of British Columbia (UBC) to the west, Spanish Banks consists of a series of beaches on the westside of Vancouver (not to be confused with the West End or West Vancouver). Close to Kitsilano and UBC, the Spanish Banks area is popular with hikers, dog-walkers, sporty beach goers and sunbathers alike. Views from here are superlative, with sweeping vistas of the North Shore mountains, downtown's cityscape, the green crown of Stanley Park, and even the Gulf Islands. Named by the Hudson’s Bay Trading Company and later made official by Captain Richards in 1859, Spanish Banks refers to the fact that the sandbanks were shown in Spanish explorer Galiano’s maps but not British Captain George Vancouver’s, even though the English and the Spanish were there at the same time in 1792. Now Spanish Banks' beaches are known for the sandy flats that appear at low-tide, which makes swimming a less popular activity — thanks to the long trek to the ocean — but makes skimboarding a very popular pastime here. Spanish Banks is divided into three areas: east, west, and the extension. The East and West areas each have eight volleyball courts on the beach (first-come, first-served) and a lifeguard in summer time between Victoria Day in late May and Labor Day in early September. Spanish Banks East is probably the busiest of the beaches as it's the first one encountered when coming from Kitsilano/downtown and it is also a place where barbecues and amplified music are permitted. Spanish Banks West has an off-leash dog area that can be found 200 meters (650 feet) west of the concession and washroom building. The West area is a designated quiet beach so no amplified sounds are allowed. Further west again is the extension area, which includes an off-leash dog area and a kiteboarding launch area. Spanish Banks is a popular place for beach parties (stay on the East beach if you want to play music or have a louder celebration) and sunbathers can be found as soon as summer hits. Dog-walkers, and anyone looking for a stroll, can be found along the seawall path that hugs the grassy areas behind the sandy beaches. Further west at Acadia Beach is the beginning of the three mile Foreshore Trail, which is a pebbly beach hike all the way around to the clothing-optional Wreck Beach. Spanish Banks can be a challenging location for swimmers because of the sandy flats at low-tide but these shallow waters make it a popular place to go skim/sandboarding and the location is also popular with kiteboarders. A launch site can be found on the western extension area. This is part of a one-year pilot scheme with a designated launch area created at the most westerly edge of the beach. Sunset is a spectacular time to visit Spanish Banks for incredible views back to downtown, the North Shore mountains, and the Gulf Islands, including Bowen and Vancouver Islands. Barbecues are permitted and picnic tables are located along the grassy areas near the beaches. Public washrooms and concessions can be found at the east and west beaches. Parking is available. Spanish Banks is close to the University of British Columbia, which has more eating options. 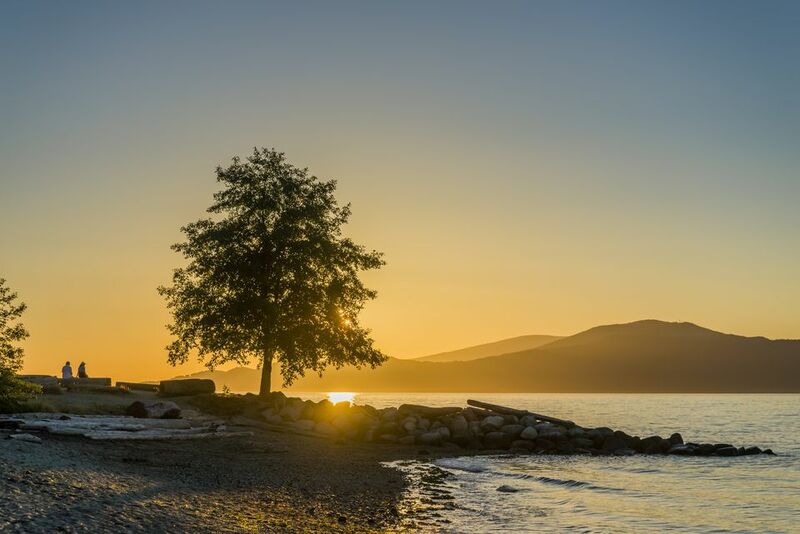 Pleasant at any time of year, the summer months between May and September are the most popular times to visit Spanish Banks for sunbathing, watersports, and volleyball but you’ll find dog-walkers and hikers here any time of year. Parking is paid between April 1 to September 30 at a rate of $3.50 an hour or $13 a day and is in effect between 6 a.m. and 10 p.m. (no overnight parking permitted). Parking is located along the edges of the beaches. To get here via transit, take the #4 or #14 bus, check Translink for trip planning from your location. The nearby University of British Columbia is home to a hub of buses that offer regular services downtown. Evo and Car2Go car shares also run throughout the city. Register online before your trip and use the app to book cars to drive around Vancouver.